The sweetest story about our resilient and amazing Rosalie! In October of 2016, Our Companions received news from a local vet that there had been an emaciated, neglected young pit bull dropped off at their office, just minutes from death. Though she should have been around 50 pounds, this beautiful little lady who the vet named Rosalie (aka Rosie), weighed in at under 20 pounds and was wasting away. It was an absolute miracle that she was still breathing. 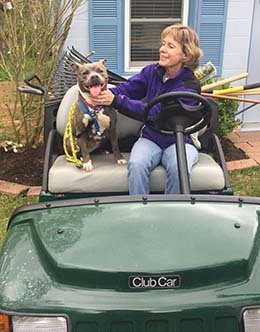 This wonderful vet’s office worked long and hard to bring her back from the brink and knew that once she was healthy enough, she would need a special place to heal and grow into the amazing dog they knew she could be – a place just like our Sanctuary!! Though we knew we would take her in when she was ready, she needed to put on some weight and stabilize before she could leave the vet. Her feet were flattened due to emaciation and she was missing patches of fur all over her body and on most of her tail. She had a long, difficult road to recovery and needed round-the-clock care just to survive. During the two and a half long months that she stayed at the vet, she got regular visits from one of our amazing volunteers, Daryl. She would take short walks outside, bundled up in comfy blankets and once she was stable enough, she would even take trips to Daryl’s house and to our office on occasion for morning trips with employees. We were absolutely amazed at the resilience that this gorgeous little lady showed. Despite the horrific abuse and neglect she had endured at the hands of her “owners”, Rosie adored people. She just wanted to be close to someone at all times and was happiest when sitting directly on top of a warm lap. She didn’t quite understand how to be a dog. Toys were a mystery and the concept of playing was foreign. She had to be bundled up in layers of jackets that hung off of her bony body and didn’t help with her constant shivers. But despite all of her health issues, she was happy and absolutely thrilled just to be close to someone any chance she could. Everyone who met her fell madly in love with this puppy-like girl. When she finally made it to the Sanctuary in January of 2017, we knew very little about the dog that she would really be when she was finally back on her feet. Rosie weighed in at right around 30 pounds and had funny shaped feet and legs due to the impact of starvation. She still required layers of jackets to keep her warm and ate multiple meals a day. She could handle short spurts in the chilly weather, but was happiest when spending time in her room or the living room with anyone who would let her on their lap. As she gained weight, she became more and more active and playful. We quickly learned that she absolutely despises other dogs and made funny little squeals whenever she saw a dog while out on her walk. She was high energy, playful, and lacked manners and training, but had loads of potential and amazed us with her love for people – especially children. Anytime a child approached her during public hours, she melted into a calmer, more relaxed version of herself and seemed at peace just to be near a little human. She would lay on the couch across their laps or sit patiently at their feet getting pets and love. When a lovely family with two toddlers came to us looking for an adoptable pet, we knew just who to introduce them to. Though we had yet to even put her up on Petfinder for adoption, we brought Rosie to a Meet & Greet event to meet her potential adopters. When they came into the room to for the first time, we were absolutely certain they were the perfect fit for our sweet Rosie. The kids were amazing with her and the calm, quiet demeanor of the entire family helped put Rosie’s anxious, excited little self at ease. Just a few short weeks later, she headed home. Rosie has settled into her forever home wonderfully. She adores her kids and gets daily walks in the woods around her house, followed by cozy couch snuggles with the entire family. Though we miss her happy-go-lucky seal face at the Sanctuary, we couldn’t possibly be happier for how her life has turned out. She finally gets to know what being loved feels like and is so adored by her entire family. 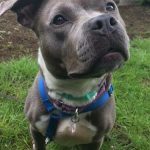 Rosie’s story is a wonderful reminder of the resilience and strength of man’s best friend, as she continues to amaze us all with her capacity to love and adore human beings despite the way they treated her in the past. 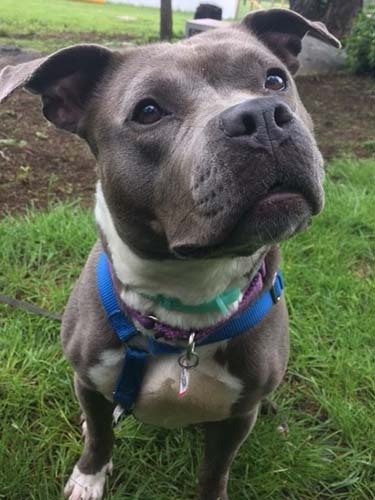 We are beyond happy to be sharing this adoption update with you just about one year after we met our beautiful Rosalie for the first time and hope that it inspires you to give a rescue pet a chance, regardless of his or her past! PS: we would like to send out a huge thank you to all of our volunteers, especially Daryl, for helping to socialize Rosie and spending so much time showing her how it feels to be loved! 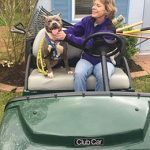 Our pets are so incredibly lucky to have such dedicated, reliable volunteers who provide them with love and care for however long they remain in our care.